Geronimo Mateos’s workshop was born out of his passion for musical instruments and is truly a tradition of Spanish craftsmanship. 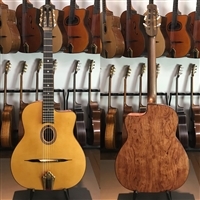 Over 20 years of experience building Selmer-Maccaferri style guitars; this father and son team have an exquisite selection of raw materials and a deep knowledge of the art of luthierie. This effort for excellence, perseverance and passion is reflected in every instrument that arrives at DjangoGuitars. Variation on the classic Mateos model with the added warmth and openness of Spanish cedar. Rosewood and spruce Selmer model with ultra-resonant oil varnish.